"Indoor baseball" redirects here. For information on indoor baseball venues, see Baseball park. For other uses, see Soft ball (disambiguation). Softball is a variant of baseball played with a larger ball (11 to 12 in. circumference) on a field that has base lengths of 60 feet, a pitcher's mound that ranges from 35-43 feet away from home plate, and a homerun fence that is 220 feet away from home plate. It was invented in 1887 in Chicago, Illinois, United States as an indoor game. The game moves at a faster pace than traditional baseball. There is less time for the base runner to get to first while the opponent fields the ball; yet, the fielder has less time to field the ball while the opponent is running down to first base. The name softball was given to the game in 1926, because the ball used to be soft, however in modern day usage, the balls are hard. A tournament held in 1933 at the Chicago World's Fair spurred interest in the game. The Amateur Softball Association (ASA) of America (founded 1933) governs the game in the United States and sponsors annual sectional and World Series championships. The World Baseball Softball Confederation (WBSC) regulates rules of play in more than 110 countries, including the United States and Canada; before the WBSC was formed in 2013, the International Softball Federation filled this role. Women's fast pitch softball became a Summer Olympic sport in 1996, but it and baseball were dropped from the 2012 Games; they will be reinstated for the 2020 Games. There are three types of softball. In the most common type, slow-pitch softball, the ball, which can measure either 11 or 12 inches in circumference depending on gender and league, must arch on its path to the batter, and there are 10 players on the field at once. In fastpitch softball, the pitch is fast, there are nine players on the field at one time, and bunting and stealing bases are permitted. Modified softball restricts the "windmill" wind-up usually used by fastpitch pitchers, although the pitcher is allowed to throw as hard as possible with the restricted back swing. Softball rules vary somewhat from those of baseball. Two major differences are that the ball must be pitched underhand—from 46 ft (14 m) for men or 43 ft (13.1 m) for women as compared with 60.5 ft (18.4 m) in baseball—and that seven innings instead of nine constitute a regulation game. Despite the name, the ball used in softball is not soft. It is about 12 in (about 30 cm) in circumference (11 or 12 in for slow-pitch), which is 3 in (8 cm) larger than a baseball. Softball recreational leagues for children use 11-inch balls until they participate in travel ball around age 12 and adjust to a 12-inch sized ball. The infield in softball is smaller than on an adult or high school baseball diamond but identical to that used by Little League Baseball; each base is 60 ft (18 m) from the next, as opposed to baseball's 90 ft (27 m). In fast pitch softball the entire infield is dirt, whereas the infield in baseball is grass except at the bases and on the pitcher's mound which are dirt. Softball mounds are also flat, while baseball mounds are a small hill. Softballs are pitched underhand, but baseballs are pitched overhand. This changes the arc of the ball when approaching the plate. For example, depending if the pitcher pitches a fastball, in softball the ball would most likely rise while in baseball because the pitcher is on a hill, the ball would drop. George Hancock is credited as the game's inventor for his development of a 17" ball and an undersized bat in the next week. The Farragut Club soon set rules for the game, which spread quickly to outsiders. Envisioned as a way for baseball players to maintain their skills during the winter, the sport was called "Indoor Baseball". Under the name of "Indoor-Outdoor", the game moved outside in the next year, and the first rules were published in 1889. In 1895 Lewis Rober, Sr. of Minneapolis organized outdoor games as exercise for firefighters; this game was known as kitten ball (after the first team to play it), lemon ball, or diamond ball. Rober's version of the game used a ball 12 inches (30 cm) in circumference, rather than the 16-inch (41 cm) ball used by the Farragut club, and eventually the Minneapolis ball prevailed, although the dimensions of the Minneapolis diamond were passed over in favor of the dimensions of the Chicago one. Rober may not have been familiar with the Farragut Club rules. Fire Station No. 19 in Minneapolis, Rober's post from 1896 to 1906, was listed on the National Register of Historic Places in part for its association with the sport's development. The first softball league outside the United States was organized in Toronto in 1897. The name "softball" dates back to 1926. The name was coined by Walter Hakanson of the YMCA at a meeting of the National Recreation Congress. (In addition to "indoor baseball", "kitten ball", and "diamond ball", names for the game included "mush ball", and "pumpkin ball".) The name softball had spread across the United States by 1930. By the 1930s, similar sports with different rules and names were being played all over the United States and Canada. By 1936, the Joint Rules Committee on Softball had standardized the rules and naming throughout the United States. Sixteen-inch softball, also sometimes referred to as "mush ball" or "super-slow pitch", is a direct descendant of Hancock's original game. Defensive players are not allowed to wear fielding gloves. Sixteen-inch softball is played extensively in Chicago, where devotees such as the late Mike Royko consider it the "real" game, and New Orleans. In New Orleans, sixteen-inch softball is called "Cabbage Ball" and is a popular team sport in area elementary and high schools. By the 1940s, fastpitch began to dominate the game. Although slow pitch was present at the 1933 World's Fair, the main course of action taken was to lengthen the pitching distance. Slow pitch achieved formal recognition in 1953 when it was added to the program of the Amateur Softball Association, and within a decade had surpassed fastpitch in popularity. The first British women's softball league was established in 1953. In 1991, women's fastpitch softball was selected to debut at the 1996 Summer Olympics. The 1996 Olympics also marked a key era in the introduction of technology in softball. The IOC funded a landmark biomechanical study on pitching during the games. The 117th meeting of the International Olympic Committee, held in Singapore in July 2005, voted to drop softball and baseball as Olympic sports for the 2012 Summer Olympic Games, but will be back in the 2020 Summer Olympics in Tokyo. Other sanctioning bodies of softball are AAU, NSA, PONY, ASA, ISC, USSSA, Triple Crown and ISA. Fastpitch softball is played between two teams on a large field, with nine players from one team on the field at a time. Slow-pitch softball is played with ten fielders. The field is usually composed of a dirt or brick-dust infield that contains the quadrilateral shape, and running areas, of a diamond, and a grass outfield. However, the field can consist of other solid and dry surfaces such as artificial turf or asphalt. There are four bases on the infield (first base, second base, third base, and home plate); the bases are arranged in a square and are typically 45 to 65 feet (14 to 20 m) apart. Near the center of this square is the pitcher's circle, and within the circle is the "rubber", a small flat rectangular piece of rubber about a foot and a half in length. The rubber can be 40 or 43 feet away from home plate, depending on age level and the league one is playing in. The object of the game is to score more runs (points) than the other team by batting (hitting) a ball into play and running around the bases, touching each one in succession. The ball is a sphere of light material, covered with leather or synthetic material. It is 10 to 12 inches (25–30 cm) (or, rarely, 16 in or 41 cm) in circumference. The game is officiated by one or more neutral umpires. Players and umpires are generally free to ask for a brief stoppage at any time when the ball is not in play (called a time out), or immediately following a play once its outcome is clear. The game is played in usually seven innings. Each inning is divided into a top half, in which the away team bats and tries to score runs, while the home team occupies the field and tries to record three outs; then a bottom half, when the teams' roles are reversed. Some leagues play with a reduced number of innings or with a time limit, rather than the traditional seven innings. To start play, the offense sends a batter to home plate. The batting order must be fixed at the start of the game, and players may not bat out of turn. The defense's pitcher stands atop the rubber and throws ("pitches") the ball towards home plate using an underhanded motion. In slow-pitch, the pitcher must have both feet in contact with the pitching rubber at all times. In fastpitch, the pitcher is allowed to take one step back prior to releasing the ball during the forward movement. The batter attempts to hit the pitched ball with a bat, a long, round, smooth stick made of wood, metal or composite. If the pitcher throws three strikes against a batter, then the batter is out and the next batter in the order comes up to bat. A strike is recorded any time a batter swings at and misses a pitch or when a batter hits a ball foul (out of play). A strike is also recorded any time the batter does not swing at a pitch that crosses home plate within an area known as the strike zone. To be within the strike zone, the pitch must cross over home plate, and as it crosses it must be above the knees and slightly below the shoulders (roughly the armpit or the shirt logo). The strike zone therefore varies from batter to batter. A pitch outside the strike zone is a ball. If the batter reaches four balls, the batter is awarded the first base in what is known as a "walk". The umpire behind home plate is the sole arbiter of balls and strikes. A foul ball may or may not result in a strikeout dependent upon what association and local league rules. However, bunting a foul ball does result in a strikeout. In some associations and leagues, bunting is not allowed and results in an out. Also, if a player has two strikes, swinging and partially hitting the ball can result in an out if the catcher manages to catch the tipped ball. The batter attempts to swing the bat and hit the ball fair (into the field of play). After a successful hit the batter becomes a baserunner (or runner) and must run to first base. The defense attempts to field the ball and may throw the ball freely between players, so one player can field the ball while another moves to a position to put out the runner. The defense can tag the runner, by touching the runner with the ball while the runner is not on a base. The defense can also touch first base while in possession of the ball; in this case it is sufficient to beat the batter to first base and an actual tag of the batter is unnecessary. A runner is said to be "thrown out" when the play involves two or more defensive players. Runners generally cannot be put out when touching a base, but only one runner may occupy a base at any time and runners may not pass each other. When a ball is batted into play, runners generally must attempt to advance if there are no open bases behind them; for example, a runner on first base must run to second base if the batter puts the ball in play. In such a situation, the defense can throw to the base that the lead runner is attempting to take (a force out), and the defense can then also throw to the previous base. This can result in a multiple-out play: a double play is two outs, while a triple play, a very rare occurrence, is three outs. Runners with an open base behind them are not forced to advance and do so at their own risk; the defense must tag such runners directly to put them out rather than tagging the base. A ball hit in the air and caught before hitting the ground, in fair or foul territory, puts the batter out. A fly ball is a ball hit high and deep, a pop fly is a ball hit high but short, and a line drive is a ball hit close to the horizontal. After the catch, runners must return to their original bases; if the defense throws the ball to that base before the runner returns, the runner is out as well, resulting in a double play. A runner who remains on the base until the ball is touched, or returns to the base (tags up) after the catch, may try to advance to the next base, at the risk of being tagged out between bases. As in baseball, the infield fly rule applies in some game situations to prevent the defense from recording multiple force outs by deliberately dropping an easy catch. Offensive strategy is mostly just to hit the ball skillfully to let the batter reach base and advance other runners around the bases to score runs. The count of balls and strikes indicates how aggressive the batter should be. The offense may try to sacrifice, with the batter deliberately making an out in order to advance runners. Defensive strategy is more complex, as particular situations (number of outs and positions of baserunners) and particular batters call for different positioning of fielders and different tactical decisions. The defense may decide to allow a run if it can achieve one or multiple outs. The playing field is divided into 'fair territory' and 'foul territory'. Fair territory is further divided into the 'infield', and the 'outfield', and the territory beyond the outfield fence. The field is defined by 'foul lines' that meet at a right angle at 'home plate'. The minimum length of the baselines varies classification of play (see below for official measurements). A fence running between the baselines defines the limits of the field; distance from home plate to the fence varies by field. Behind home plate is a 'backstop'. It must be between 25 and 30 feet (7.62 and 9.14 meters) behind home plate depending on the type of division that is playing. 'Home Plate' is one corner of a diamond with 'bases' at each corner. The bases other than home plate are 15 in (38 cm) square, of canvas or a similar material, and not more than 5 in (13 cm) thick. The bases are usually securely fastened to the ground. The bases are numbered counter clockwise as first base, second base, and third base. Often, but not always, outside first base (that is, in foul territory) and adjacent and connected to it, there is a contrast-colored "double base" or "safety base". It is intended to prevent collisions between the first baseman and the runner. The runner runs for the foul portion of the double base after hitting the ball while the fielding team tries to throw the ball to the regular first base before the runner reaches the safety base. However, not all softball diamonds have these safety bases and they are much more common in women's softball than in men's. The double base is required in ISF championships. Near the center of the diamond is the pitching plate. In fastpitch, a skinned circle 16 feet (4.88 meters) in diameter known as the pitching circle is around the pitching plate. A field is officially required to have a warning track between 15 and 12 feet (5 and 4 meters) from the outfield fence. However, if the game is being played on a field larger than required, no warning track is required before the temporary outfield fencing. Located in foul territory outside both baselines are two 'Coach's Boxes'. Each box is behind a line 15 feet (5 meters) long located 12 feet (3 meters) from each baseline. Under 18 girls / 8 and under is coach pitch. 10 and under is 35' kid pitch distance. 12 and under is 40' kid pitch distance. 14 and older is 43' kid pitch distance. High school distance is 43' pitch distance. There is a little league distance also: 35 feet for minors, 38 feet for majors, 43 feet for middle school. Equipment required in softball includes a ball, a bat (composite, metal or wooden), gloves, uniforms and protective gear: for example, helmets for the offensive team and a helmet, shin guards and chest protector for the defensive catcher. Also cleats, sliding shorts, face masks, chest or heart protector, and knee sliders may be worn for softball. Despite the sport's name, they are not soft at all. The size of the ball varies according to the classification of play; the permitted circumferences in international play are 6999304799999999999♠12±0.125 in (6999305000000000000♠30.5±0.3 cm), in mass between 6.25 and 7.0 oz (177–198 g) in fastpitch; 6999279399999999999♠11±0.125 in (6999297000000000000♠29.7±0.3 cm), mass between 5.875 and 6.125 oz (166.6–173.6 g) in slow pitch. For comparison, under the current rules of Major League Baseball, a baseball has a mass between 5 and 5 1⁄4 ounces (142–149 g), and is 9 to 9 1⁄4 inches (229–235 mm) in circumference (2 7⁄8–3 in or 73–76 mm in diameter). A 12-inch circumference ball is generally used in slow pitch, although in rare cases some leagues (especially recreational leagues) do use a 14-inch circumference ball. Some balls have a raised seam, and others do not. The ball is most often covered in white or yellow leather in two pieces roughly the shape of a figure-8 and sewn together with red thread, although other coverings are permitted. The core of the ball may be made of long fiber kapok, or a mixture of cork and rubber, or a polyurethane mixture, or another approved material. In 2004, high-visibility yellow "optic" covering, long-used for restricted flight balls in co-ed recreational leagues, became standard for competitive play. Yellow is the color of official NCAA and NAIA softballs. Yellow softballs are fast becoming the standard for all levels of play for girls' and women's play in particular. White balls are also allowed, but are very uncommon in slow pitch and fastpitch. In Chicago, where softball was invented, it remains traditional to play with a ball 16 inches (41 centimeters) in circumference. The fielders do not wear gloves or mitts. A 16" softball when new is rough and hard, with hand and finger injuries to fielders frequent if they do not "give" when receiving a ball, but the ball "breaks in" slightly during a game and continues to soften over time with continued play. A well-broken-in ball is called a mush ball and is favoured for informal "pick-up" games and when playing in limited space, such as a city street (because the ball does not go as far). A 16-inch ball is also used for wheelchair softball. The bat used by the batter can be made of wood, aluminum, or composite materials such as carbon fiber. Sizes may vary but they may be no more than 34 inches (86 cm) long, 2.4 inches (6 cm) in diameter, or 38 ounces (1.1 kg) in mass. The standard bat barrel diameter for both slowpitch and fastpitch softball is 2​1⁄4 inches. Many players prefer a smaller barrel, which reduces mass and allows higher swing speed. Although there are a variety of bats used, there are several that are banned due to performance enhancement. These bats are determined to be illegal by the Amateur Softball Association of America. Several bats are banned because of the harm it may place upon other teams and/or giving them an unfair advantage. For example, with a thinner wall, players are able to swing the bat faster, which allows the ball to go faster, harder, and further. Major League Softball, played at Recreational Parks, include a variety of teams; Men's, Women's, Co-Ed. Each League has its own specific regulations with bats, but most must be approved by the Amateur Softball Association. Many bats may be "doctored" or "juiced" in a sense that they are end loaded, shaved and or painted. End loading of a cap refers to the addition of weight manually placed at the end of the barrel to distribute more weight at the tip. Shaving bats require machine use in order to remove the inner walls of the bat to improve elasticity. Lastly, painting bats is done because competitors purchase "illegal" bats that are dangerous and hazardous to the opposing team. These three "doctored" and "juiced" techniques are banned from Leagues, but are still done today. All defensive players wear fielding gloves, made of leather or similar material. Gloves have webbing between the thumb and forefinger, known as the "pocket". No part of the glove is allowed to be the same color as that of the ball, including that of its seams. Pitchers are also not allowed to have any white on their gloves including the seams. It is up to the umpire's discretion if he or she believes that any coloring on the glove interferes with or hinders the batter from seeing the ball clearly. Gloves used in softball are usually larger than the ones used in baseball. No glove larger than 14 in (36 cm) can be used in ASA (American Softball Association) sanctioned play. There are different size gloves for different positions on the field. For example, catchers and 1st baseman have what is called a mitt, whose pockets are larger than other gloves. The catcher's glove has extra padding in it and does not have finger holes. The 1st baseman's glove also has extra padding, but with finger holes. An outfielder's glove is smaller than the catcher's, typically 13 inches to 14 inches, but large enough to give extra reach in catching a fly ball. An infielder's glove is the smallest, typically from 11 inches to 13 inches. Its small size allows faster removal of a caught ball in order to throw with the other hand. A pitcher's glove can be of any size, but should be large enough to cover the ball, so that the batter cannot see the pitcher's grip on the ball. Each team wears a distinctive uniform. The uniform may include a cap or visor, a shirt, tight sliding undershorts (optional), knee length socks, and pants; these are the components for which standards are set. The team is required to have all of its members wear the same uniform. Caps, visors, and headbands are optional for female players, and have to be the same color. Caps are mandatory for male players. A fielder who chooses to wear a helmet (see below) is not required to wear a cap. Many female players use "sliding shorts", otherwise known as compression shorts in other sports. These shorts help to protect the upper thigh when sliding into a base. "Sliders" may also be worn for similar protection. These are somewhat padded shinguards that extend usually from the ankle to the knee of the wearer and wrap all the way around the leg(s). They protect the shin, calf, etc. from getting bruised or damaged while sliding into homeplate and make it much more comfortable to slide into the plate. Most male players use long, baseball-style pants. However, some female players now wear a shorter version of baseball pants. At the back of the uniform, an Arabic numeral from numbers 0 through 99 must be visible. Numbers such as 02 and 2 are considered identical. Also, on the back of the uniforms players' names are optional. All players are required to wear shoes. They may have cleats or spikes. The spikes must extend less than 0.75 in (19 mm) away from the sole. Rounded metal spikes are illegal, as are ones made from hard plastic or other synthetic materials. High school athletes are sometimes permitted to wear metal cleats, such as in Ohio. Many recreational leagues prohibit the use of metal cleats or spikes to reduce the possible severity of injuries when a runner slides feet-first into a fielder. At all youth (under 15) levels, in co-ed (the official terminology for mixed teams) slow pitch, and in modified pitch, metal spikes are usually not allowed. A helmet must have two ear flaps, one on each side. Helmets and cages that are damaged or altered are forbidden. Helmets must be worn by batters and runners in fastpitch. Helmets are optional in slowpitch. In NCAA fastpitch softball you have the option to wear a helmet with or without a face mask. Most female travel ball teams for fastpitch softball require the batter to wear a helmet with a face mask. In male fastpitch masks are generally only used for medical reasons. In fastpitch, the catcher must wear a protective helmet with a face-mask and throat protector, shin guards and body protector. Shin guards also protect the kneecap. In slow pitch, the catcher must wear a helmet and mask at youth levels. At adult levels, there is no formal requirement for the catcher to wear a mask, although the official rules recommend it. A female catcher may optionally wear a body protector in slow pitch. There is an option to wear a face mask on the field. It is recommended in lower age groups. Decisions about plays are made by umpires, similar to a referee in American football. The number of umpires on a given game can range from a minimum of one to a maximum of seven. There is never more than one "plate umpire"; there can be up to three "base umpires", and up to a further three umpires positioned in the outfield. Most fastpitch games use a crew of two umpires (one plate umpire, one base umpire). Official umpires are often nicknamed "blue", because of their uniforms – in many jurisdictions, most significantly ISF, NCAA and ASA games, umpires wear navy blue slacks, a light powder blue shirt, and a navy baseball cap. Some umpires wear a variant of the uniform: some umpires in ASA wear heather gray slacks and may also wear a navy blue shirt; umpires from the USSSA wear red shirts with grey slacks; National Softball Association (NSA) umpires wear an official NSA white-colored umpire shirt with black pants or black shorts; NSA fastpitch umpires wear the white NSA umpires shirt and heather gray slacks. Decisions are usually indicated by both the use of hand signals, and by vocalizing the call. Safe calls are made by signaling with flat hands facing down moving away from each other, and a verbal call of "safe". Out calls are made by raising the right hand in a clenched fist, with a verbal call of "out". Strikes are called by the plate umpire, who uses the same motion as the out call with a verbal call of "strike". Balls are only called verbally, with no hand gesture. The umpire also has the option of not saying anything on a ball. It is understood that when he stands up, the pitch was not a strike. Foul balls are called by extending both arms up in the air with a verbal call of "foul ball", while fair balls are indicated only by pointing towards fair territory with no verbal call. No signal is given for balls that are obviously foul and for closer calls that are not borderline; a mere acknowledgement signal is given. All decisions made by the umpire(s) are considered to be final. Only decisions where a rule might have been misinterpreted are considered to be protestable. At some tournaments there might be a rules interpreter or Tournament Chief Umpire (TCU) (also known as the Umpire In Chief, or UIC) available to pass judgment on such protests, but it is usually up to the league or association involved to decide if the protest would be upheld. Protests are never allowed on what are considered "judgment calls" – balls, strikes, and fouls. A softball game can last anywhere from 3 to 7 innings, or 1–2 hours depending on the league, rules, and type of softball; however 7 innings is the most common. In each inning, each team bats until three batters have been put out (see below). The teams take turns batting. Officially, which team bats first is decided by a coin toss, although a league may decide otherwise at its discretion. The most common rule is that the home team bats second. Batting second is also called "last at-bat". Many softball players prefer to bat second because they feel they have more control in the last inning, since they have the last at-bat. In the event of a tie, extra innings are usually played until the tie is broken except in certain tournaments and championships. If the home team is leading and the road team has just finished its half of the seventh inning, the game ends because it is not necessary for the home team to bat again. In all forms of softball, the defensive team is the fielding team; the offensive team is at bat or batting and is trying to score runs. Play often, but not always, begins with the umpire saying "Play Ball". After the batter is ready and all fielders (except the catcher) are in fair territory at their respective positions, the pitcher stands at the pitching plate and attempts to throw the ball past the batter to the catcher behind home plate. The throw, or pitch, must be made with an underarm motion: the ball must be released below the hip when the hand is no farther from the hip than the elbow to get it in the strike zone. For fastpitch softball, the traditional pitching style is a "windmill" motion, extending the arm over the body and releasing the ball at about hip level at maximum speeds. Strength acquired in the underhand windmill motion is based from the open to close hip motion. Without correct form and hip movement, pitches can be inaccurate and can lose strength and speed. In girls' fastpitch, 12u up to 18u level can throw between 30 mph and 65 mph, or more. Speed is not always the most important factor in fastpitch softball. Pitchers can throw balls that curve inwards (screwball) and outwards (curveball) on right-handed batters. Curves may be thrown on the outside or off of the plate or inside off the plate moving into the strikezone. There are also riseballs that break upwards frequently starting in the strikezone and ending above it. Riseballs may be thrown low in the zone and move higher in the zone or even below the zone and move into it. Drop balls and drop curves (to cause the batter to miss or hit groundballs; this is important at the higher levels where strikeouts occur less often). The other common pitches are change-up and fastballs. A change of pace (off-speed) is also very important, good pitchers will be able to throw all their pitches at varying speeds and possibly even different pitching motions. Pitchers use deception as a primary tactic for getting batters out as the reaction times are approximately half a second or less. The pitcher throws the ball in or around the "strike zone". However, in advanced play pitcher and catcher play a psychological game trying to get the batter to guess where the next pitch is going and if it will be a strike. In other instances, such as when an extremely powerful hitter comes up to bat and they are followed by a weaker hitter, a pitcher may deliberately walk the first batter based on the calculation that the next batter will be an easy out. The strike zone is slightly different in different forms of softball. A pitch that passes through that zone is a "strike". A pitch that the batter swings at is also a strike, as is any hit ball that lands in foul territory. A pitch which is not a strike and which the batter does not swing at is known as a "ball". The number of balls and strikes is called the "count". The number of balls is always given first, as 2 and 1, 2 and 2, and so on. A count of 3 and 2 is a "full count", since the next ball or strike will end the batter's turn at the plate, unless the ball goes foul. There is also an illegal form of pitching known as "crow-hopping". A "crow hop" occurs when the pitcher pushes with the pivot foot from somewhere other than the pitching plate. This often involves jumping from the pitching plate and replanting somewhere in front of the pitching plate. The umpire sticks his left arm out straight to the side and clenches his fist. This results in a ball being awarded to the batter, and any runners on base advancing to the next base. If the batter swings at the pitch that is deemed illegal and puts the ball in play, the defense is given the option to accept the results of the play or accept the penalty listed previously. Image to the right demonstrates a legal pitch as the push-off foot has not left the ground. The ball must be released simultaneously with the lead leg step. In fastpitch softball, there are various types of pitches. Some are: the fastball, changeup, dropball, riseball, screwball, curveball, dropcurve, dropchange. In 16-inch softball, as well as a number of varieties of slow pitch, the pitch is lobbed so that the ball rises above the batter's head and lands on either the plate itself or a small rectangular area on the ground behind the plate. (These restrictions make it much easier to put the ball into play and extremely difficult to use pitching as a defensive strategy, as the physics of projectile motion limit how fast a ball can be thrown under such conditions and still be called a strike to a speed much slower than a traditionally thrown ball.) Umpires will make calls based on where the ball lands behind the plate. A pitch in "the well" (pictured) is considered a perfect pitch. In other varieties of slow pitch (sometimes known as "modified"), the only restriction is that the windmill cannot be used; thus the pitching arm cannot be raised above the shoulder and both the wind-up and the release must be underhand, still allowing for moderate speed and control in pitching. At higher levels of play, pitchers aim for the inner and outer corners of the plate when throwing fastballs and moving pitches. Pitchers also vary the location of the pitch by height to make hitting the ball even harder for the individual up at bat. Similarly, both the dropball and the riseball are pitches that change heights. To the batter, the dropball appears to be coming in level but then as the ball reaches the plate, the pitch drops, trying to force the batter to hit the top of the ball. This should result in the batter missing or hitting a groundball. When pitchers throw riseballs, batters see the ball coming in straight, but as the ball approaches the plate, it rises. Frequently the purpose of the riseball is to have the batter attempt to chase a ball which ends up out of the strikezone and is either missed entirely or hit as an easy pop-fly. Another pitch that breaks at the last minute is the curveball. When pitchers throw curveballs they snap their wrist and follow their arm across their body, making the ball curve to the outside of the plate. There is also something called the inside curve where ball start off the plate on the inside and curves into the strikezone. The inside curve is frequently thrown at the batters hands so as to jam them forcing a foul hit. Pitchers can also make the ball curve or screw to the inside of the plate. The one pitch that drastically changes speed is the changeup, disrupting the batter's timing. Pitchers also throw knuckle balls which are generally slower and move erratically. Fastpitch pitches may reach high speeds; At the 1996 Summer Olympics one pitch reached 73.3 miles per hour (118 kilometers per hour). Male pitching can reach speeds around 85 miles per hour (137 kilometers per hour). To compare, MLB players average around 90 mph but can reach speeds up to 100 mph. The offensive team sends one "batter" at a time to home plate to use the bat to try to hit the pitch forward into fair territory. The order the players bat in, known as the "batting order", must stay the same throughout the game. Substitutes and replacements must bat in the same position as the player they are replacing. In co-ed, male and female batters must alternate. The batter stands facing the pitcher inside a "batter's box" (there is one on each side of the plate to compensate for either right or left handed batters). The bat is held with both hands, over the shoulder, and away from the pitcher (90 degree angle). The ball is usually hit with a full swinging motion in which the bat may move through more than 360 degrees. The batter usually steps forward with the front foot, the body weight shifts forward, as the batter simultaneously swings the bat. A bunt is another form of batting. There are different types, including a sacrifice bunt, or slap bunt. There is also regular slapping in which a batter takes position on the left side of the plate and usually stands in the back of the box, but it is possible form anywhere. The batter takes a step back with their leading foot as the pitcher is in the middle of the windup, crosses over with their back foot and runs toward first base while they swing. There are many different types of slapping and they all vary depending on the batter and their strengths. There are half swing slaps, fake slaps, and full swing slaps. Each type of slap has a different purpose or goal. No matter what way the batter hits the ball, they must be inside the batter's box when the bat makes contact with the ball. If the batter steps out of the box while swinging, the batter is out. Once the ball is hit into fair territory the runner must try to advance to first base or beyond. While running to first base, the batter is a "batter-runner". When she safely reaches first (see below) she becomes a "base-runner" or "runner". A batted ball hit high in the air is a "fly ball". A fly ball hit upward at an angle greater than 45 degrees is a "pop fly". A batted ball driven in the air through the infield at a height at which an infielder could play it if in the right position is a "line drive". A batted ball which hits the ground within the diamond is a "ground ball". If a batted ball hits a player or a base, it is considered to have hit the ground. A batter can also advance to first if hit by the pitch. If a batter is hit by the pitch it is a dead ball and she is rewarded first base. She must make an attempt to get out of the way and it is the umpire's judgmental call whether the batter attempted to move. If he feels the batter could have moved and avoided getting hit he or she will not reward the batter first base and the pitch will be recorded as a ball. The batter is out if: three strikes are called (a "strikeout"); a ball hit by the batter is caught before touching the ground (a "flyout"); the batter goes to a base that is already tagged ("tagged" or "tag play"); a fielder holding the ball touches a base which is the only base towards which the batter may run before the batter arrives there (a "force out" or "force play"); or in certain special circumstances. There is also a not so common occurrence when the batter has 2 strikes and swings at strike three. If the catcher doesn't catch the ball, the batter has the chance to run to first base and the catcher can throw the batter out at first base. A player trying to avoid a tag at third base. If the player hits the ball and advances to a base without a fielding error or an out being recorded, then that is called a "base hit". The bases must be reached in order counterclockwise, starting with first base. After hitting the ball the batter may advance as many bases as possible. 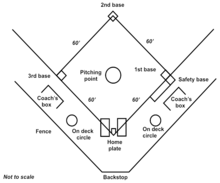 An advance to first base on the one hit is a "single", to second base is a "double", to third base is a "triple", and to home plate is a "home run". Home runs are usually scored by hitting the ball over the outfield fence, but may be scored on a hit which does not go over the fence. A home run includes any ball that bounces off a fielder and goes over the fence in fair-territory (depending upon association and local league rules) or that hits the foul pole. If a batted ball bounces off a fielder (in fair territory) and goes over the fence in foul territory, or if it goes over the fence at a location that is closer than the official distance, the batter is awarded a double instead. If a runner becomes entitled to the base where another runner is standing, the latter runner must advance to the next base. For example, if a player hits the ball and there is a runner on first, the runner on first must try to advance to second because the batter-runner is entitled to first base. If the batter reaches first base without being put out, then that player can then be forced to run towards second base the next time a ball is driven into fair territory. That is because the player must vacate first base to allow the next batter to reach it, and consequently can only go to second base, where a force out may be recorded. Runners may advance at risk to be put out: on a hit by another player; after a fly ball has been caught, provided the player was touching a base at the time the ball was first touched or after; or (in fastpitch) automatically, when a pitch is delivered illegally. Runners advance without liability to be put out: when a walk advances another player to the runner's current base; or automatically in certain special circumstances described below. If there is a "wild throw" (or "overthrow") in which the ball goes out of the designated play area, each runner is awarded two bases from the last base touched at the time of the throw. Retreating past a made base, negates the advance to that base. If a fielder intentionally carries a ball out of play, two bases are awarded from the time the ball leaves the field of play. If this is unintentional (fielder's momentum), the award is one base. If on a tag play, the fielder loses control (after establishing control) of the ball and it leaves the field of play, one base is awarded. If there is a "wild pitch" in which the ball goes out of the designated play area, each runner is awarded one base from the base occupied at the time of the pitch. In fastpitch, runners may try to steal bases by running to the next base on the pitch and reaching it before being tagged with the ball. The point at which a runner can steal a base varies. In fastpitch, the runner is allowed to begin stealing a base when the ball is released from the "windmill" pitching motion, but until recently, stealing was forbidden in slow pitch because a runner has the opportunity to get a larger head start while the slow pitch is making its way to the batter. As a result of rule changes initiated by the Independent Softball Association which later made its way to the Amateur Softball Association and the International Softball Federation in the 21st century, most levels of slow pitch permit stealing bases, provided the runner starts when the ball either touches the ground or crosses the plate. This rule encourages pitchers to be more responsible with the pitch and catchers to play defense, as balls which miss the catcher are now grounds to have stolen bases. No matter what level of play, all baserunners must keep one foot on a base until the pitcher throws the ball or until the ball crosses the front edge of home plate (depends on association). In fastpitch, if the catcher drops strike three (a "passed ball") with less than two outs, the batter can attempt to run to first base if first base is unoccupied. The catcher must then attempt to throw the ball to first base ahead of the runner. If he or she cannot, the runner is safe. With two outs, the batter can attempt to run to first whether or not it is already occupied. Depending on the league in slow pitch only a foul ball with two strikes on the batter means the batter is out. Stealing in 16-inch softball is severely restricted, as a runner may only steal the base in front of them if it is open, and if they are thrown at, à la pickoff move or snap throw. This results in many inexperienced players being thrown or doubled off when they attempt to advance on a wild pickoff at another baserunner. A "run" is scored when a player has touched all four bases in order, proceeding counterclockwise around them. They need not be touched on the same play; a batter may remain safely on a base while play proceeds and attempt to advance on a later play. A run is not scored if the last out is a force out or occurs during the same play that the runner crosses home plate. For instance, if a runner is on third base prior to a hit, and he or she crosses home plate after an out is made, either on the batter or another runner, the run is not counted. If the game is tied, play usually continues until a decision is reached, by using the international tie-breaker rule or if time is expired the score would be just tied. Starting in the top of the last inning, the batting team starts with a base-runner on second base, which is the player who is the last available to bat (in other words, the batter who last took their position in the batter's box; regardless whether they were the last out or another runner was put out). In games where one team leads by a large margin, the run ahead rule may come into play in order to avoid embarrassing weaker teams. In fastpitch and modified pitch, a margin of 15 runs after three innings, 10 after four, or 7 after five is sufficient for a win to be declared for the leading team. In slow pitch, the margin is 20 runs after four innings or 15 after five innings. In the NCAA, the required margin after 5 innings is 8 runs. The mercy rule takes effect at the end of an inning. Thus, if the team batting first is ahead by enough runs for the rule to come into effect, the team batting second is given their half of the inning to try to narrow the margin. A game may be lost due to a "forfeit". A score of 7–0 for the team not at fault is recorded (generally one run is awarded for each inning that would have been played). A forfeit may be called due to any of these circumstances: if a team does not show up to play; if one side refuses to continue play; if a team fails to resume play after a suspension of play ends; if a team uses tactics intended to unfairly delay or hasten the game; if a player removed from the game does not leave within one minute of being instructed to do so; if a player that cannot play enters the game and one pitch has been thrown; if a team does not have, for whatever reason, enough players to continue; or if after warning by the umpire, a player continues to intentionally break the rules of the game. This last rule is rarely enforced as players who break rules after being warned are usually removed. The plate umpire may suspend play because of darkness or anything that puts players or spectators in danger. If five innings have been played, the game is recorded as it stands. This includes ties. If fewer than four innings have been played, the game is not considered a "regulation" game. Games that are not regulation or are regulation ties are resumed from the point of suspension. If it is a championship game, it is replayed from the beginning. Team rosters may be changed. There are nine players out on the field at one time in fastpitch softball and 10 players in slow-pitch softball. Although the pitcher and catcher have the ball the most, each person has a specific job. In the infield there is the pitcher, catcher, first baseman, second baseman, shortstop, and third baseman. In the outfield there is a left fielder, center fielder, and right fielder. In slow-pitch softball there is an extra outfielder in the outfield, who is specified as a roamer or rover. Normally, the defensive team will play with four outfielders, meaning there is a left fielder, left-center fielder, right-center fielder, and right fielder. The recent trend with tournament and league slow pitch softball play is to field 5 infielders instead of 4 outfielders. The extra infielder is commonly placed behind the pitcher on either side of 2nd base. In fastpitch softball, it is common for teams to use a designated player in the lineup; this player, which functions like the designated hitter in baseball, hits in place of one of the position players but does not play defense. Unlike a designated hitter, a designated player can also become a temporary defensive substitute, and the player substituted by the designated player can return to their original position at a later point in the game. However, the only player that can be substituted as an offensive replacement (pinch runner or pinch hitter) is the defensive player the designated player originally replaced, known as the "flex". At any time, the designated player can be substituted back into the lineup in the place of the flex player, but once taken out, the designated player cannot take the place of any other player in the lineup. The pitcher is the individual who throws the ball from the middle of the diamond. As in baseball, fastpitch softball has a rubber used to control the pitchers delivery. A pitcher must have both feet on the rubber at the start of their delivery but neither foot is on the rubber when the ball is released. In baseball, the rubber is on a mound of dirt as gravity is used to generate speed. In softball, the pitchers throw from within a circle and the rubber in the circle is not elevated. The circle is also used to control base runners. When the pitcher is in possession of the ball in the circle, a runner who has passed a base must either advance or return to the base. They cannot "bait" the pitcher to throw or they will be called out. The pitcher tries to throw the ball in the strike zone. In order to do that, they start while having the ball in their glove, they throw their arms behind their hips, they shoot forwards with their leg, which is on the same side as their glove, and leave their glove hand there and the other arm goes around the shoulder, bends the elbow, and turns their wrist toward the 3rd baseman, and brings their arm through at the end, flicks their wrist, and brings the arm up, with the hand by their shoulder. They follow through with their legs turning their pitching stance into a fielding stance. They try to release the ball when they go past their hips. In softball, the pitcher uses an underarm motion to pitch the ball towards the strike zone. As soon as the pitcher makes a throw, the fielders are ready to field balls that are hit in the middle of the diamond. Pitchers usually tend to be tall, very flexible and have good upper body strength. Pitchers can be righthanded or lefthanded. The softball pitcher makes a windmill motion while throwing underhand, unlike baseball pitchers who throw overhand. The catcher is normally behind home plate in a squatted position (some plays may require the catcher to stand at an angle for intentional walks). At the plate the catcher is responsible for catching pitches, keeping mispitched balls in front of the plate, calling pitches that are normally done through hand signals, and they are considered the leaders of the field. Catchers must know how many outs there are, the number of strikes and balls on the batter so they can relay that to their teammates. They must also know how many runners are on base and where the ball should be thrown next in the following play. Catchers are strong, need to be smart and quick on their feet, and have accurate throws so they can pick runners off at each base. Catchers should be able to have strong and muscular legs to squat for a long period of time. The gear worn by a catcher protects them from balls thrown in the dirt or wild pitches. The catcher is allowed to take off his/her mask to catch a pop fly or to watch the play. The catchers gear can be very hot. Some catchers wear pads under their knees to help keep the knees healthy. The first baseman is the position to the left side of the diamond when facing home plate. The major role of the first baseman is to receive throws from other defensive players in order to get a force play at first base. Another role they play is to make fielding plays on all balls hit towards first base. The first baseman is usually involved in every play that occurs on the field. Individuals at first base have quick hands and good reach, and are always on the lookout to catch the player off base. They are also generally taller and left-handed throwing, which gives them an extended reach. First basemen however, can be both left and right handed. Just like the catcher, first basemen may wear specific first base mitts, usually having a longer web allowing them to reach the taller throws over their head. The second baseman plays in between the first baseman and second base itself, usually closer to second base. If the ball is hit to the left side of the field, the second baseman covers second base. If the ball is hit to right-field or center field, they become the cut-off for the center fielder or the right fielder depending who the ball was hit to. If the ball is hit to the first baseman, the second baseman then is responsible for covering first. If the ball is hit to the second baseman, they either throw the ball to second if there was already a player on first, or they throw to first if there was nobody on. If there is a runner on first and the person up to bat hits the ball to the shortstop or the third baseman, the second baseman is in charge of covering second to receive the throw from the shortstop or third baseman. Then, depending where the runner is between home and first, the second baseman makes the decision to throw the ball to first or to hold the ball. Also, in the case of a bunt, the second baseman must cover first as the first baseman runs to get the ball from the bunt, then it is often thrown back to first base. The shortstop fields all balls hit to the infield between the second and third bases. This individual also helps cover second and third bases, is frequently involved in force plays and double plays, and often throws the ball to the catcher to throw out runners at home plate. On steals to second base (when the runner from first is advancing to second on the pitch) the shortstop usually covers. The shortstop doesn't cover second base only when a right handed batter is up. In this case, the second baseman covers the steal. Most short stops are very quick, agile and think fast. Shortstops may play in a restricted zone but are faced with many types of hits and interact closely with the 2nd base, 3rd base and home plate. Often double plays are due to quick thinking/reaction by the short stop. When a ball is hit up the middle and the shortstop catches it, they will flip the ball to the second baseman for the best result. Shortstop also takes the cut off for the left field when the play is at second base. When the ball is hit to the right side of the outfield, the short stop then covers second base. If there is a runner on first base and there is a hit down the line or in the gap to right field, the shortstop will then go for the cut to third. Meaning the runner that is going from first to second will most likely be advancing to third, and in that case, the shortstop will be the cut off for the throw from right field to third base. Shortstop can be one of the most difficult positions to play due to the number of balls being hit in that direction. The third baseman is the position on the right side of the diamond when you are facing home plate. They are responsible for fielding all balls hit their way including bunts. In fact, the third baseman fields more bunts than a pitcher and first baseman do. Third base is also called the "Hot Corner" because the ball can pop off the bat at the fielder very fast. Third baseman must have great reflexes and be very quick on their feet because not only to they need to be quick to field a bunt but also if they are unable to predict whether the batter will bunt or hit, a ball that is hit may be a line drive to the face. It also helps if they can run fast but it isn't a requirement. A third baseman must have a very strong arm so that they can throw a runner out from across the diamond. Any ball that the third baseman can get, they should. They will have more momentum towards first base when fielding the ball than a shortstop. They are also closer to first base when they cut off a slower ground ball towards shortstop. Third baseman are responsible for covering third base at all times unless the ball is hit to them. In that instance, the shortstop is responsible for third base. Third baseman must be smart, have great reflexes, have a strong arm, and be quick with their hands. The outfielders are players that cover the grassy area behind the infield. Outfielders are named for their positions in the field relative to home plate. Traditional outfield positions include a left fielder, a center fielder, and a right fielder. Each player has specific job as being an outfielder. In some leagues and organizations, four outfield players are utilized by each team, with the center field position being shared between two players known as the left-center fielder and the right-center fielder (or, alternatively, the deep center fielder and the short fielder). The right fielder's position is on the right side of the field, behind the first baseman, when looking at the field from behind home plate. The right fielder is part of a group of two other fielders that make up the outfield. The right fielder has a multitude of jobs over the course of a softball game. Generally, outfielders act as a back-up to the infielders when they make plays or if the ball is hit past the infield. Right field has a particular job of covering the area behind first base if the ball is to be thrown in that area. Right field is meant to cover this area is the ball gets past the first baseman. This will prevent base-runners from advancing to unwanted bases. Traditionally in the game of softball, the right fielder will have the strongest arm out of the two other outfielders. The right fielder must have the strongest arm because they have the furthest possibility to throw the ball. A right fielder will throw the ball to each base more than the other outfielders will because of their position in respect to the bases. The center fielder's position is in the middle of the outfield directly behind second base when looking at the field from behind home plate. The center fielder is part of a group of two other fielders that make up the outfield. Center fielders technically serve as the "captains" of the outfield. They are and should be the most vocal in effectively communicating with their outfielders. Since the outfielders are further apart from each other, it can be hard to hear each other. The center fielder covers the area behind second base if the ball is going to be thrown in that direction. By covering this area, if the ball does get past the infielder, the center fielder can prevent base-runners from advancing to unwanted bases. Within the game of softball, the center fielder is traditionally the fastest of the three outfielders. The center fielder needs to be the quickest because of the large area of field they must cover. Besides being a quick player, the center fielder must have a strong throwing arm because of the distance between the player and home plate. The left fielder's position is on the left side of the outfield behind the third baseman when looking at the field from behind home plate. The left fielder is part of a group of two other fielders that make up the outfield. Generally, outfielders act as a back-up to the infielders when they make plays or if the ball is hit past the infield. The left fielder must field their position, but also cover the area behind third base if a ball is thrown or hit in that direction. The left fielder covers this area in the case that the ball will pass the infielders. The left fielder can then prevent the base runner from advancing to unwanted bases. Besides covering certain areas of the field, the left fielder must be the smartest of the outfielders. In the left field position, the player has full view of the field, the players, the base-runners, and the batter. The left fielder must constantly be aware of the situation on the field and know what must be done in different circumstances. More advanced levels require the left fielder to be able to field the ball during "slap hit" situations by playing shallow. Left fielders must also play a role in any run down situation between third base and home plate or back up any plays that happen at third base in case of an overthrow. One reason for the popularity of softball is the ease of modification of its rules, thereby allowing the game to be adapted to a variety of skill levels. For example, in some slow pitch softball leagues a batter starts at bat with a count of one ball one strike. In some leagues, the number of home runs that can be hit by a team are limited. In other leagues, stealing of bases is prohibited. Some groups allow for a more defensive game by making home plate a force out for first base. This reduces scoring evenly on both sides, and allows for some margin of error. Co-recreational leagues, where men and women play on the same team, often adopt rules intended to reduce gender inequality, under the assumption that men will be generally more powerful. For example, rules may stipulate that there must be an equal number of men and women on the team, or that batting order alternate male and female batters. Some leagues only require 3 women to play but they must be present on the field at all times. In most co-ed or mixed gender leagues there is something called an encroachment line. This requires the outfielders to stay behind a line till the ball is hit. If an outfielder passes in front of this line before the female batter hits a fair ball, the batter will receive a single base or the result of the play, and the base runners will advance accordingly. The line will be 180 feet from home plate. One possible rule requires male batters to "switch hit". Some leagues even use different balls for male and female batters. While these modified rules are common, there are questions as to their place in modern adult sports. Some leagues require teams to use limited flight softballs. These softballs, when hit, will not go as far as regular softballs. Other leagues limit the number of runs which can be scored in an inning. Five is a common limit. By allowing these and other modifications, softball can be enjoyed by children, teenagers, and adults. Senior leagues with players over the age of 60 are not uncommon. An example of a rule modification is the "offensive pitcher" (or "self pitch") often found in informal games where the emphasis is on the social rather than the competitive aspects of the game. The pitcher aids the batter by attempting to give the easiest pitch to hit. There are no walks, and a batter is normally given a fixed number of pitches to attempt to hit (usually 3 or 4). The batter is considered to strike out if the batter fails to hit the ball into fair territory after the given number of pitches. The pitcher does not act as a fielder, and a rule is often made that if a batted ball touches the pitcher, the batter is out. In some leagues the number of pitches to walk or strikeout can be reduced. For instance, one strike is an out, and two balls is a walk. This is common in leagues where doubleheaders are played, or in late season leagues when reduced daylight is an issue. It results in shorter games, as players are more apt to swing, even at marginal pitches, rather than risk striking out on one pitch. Many leagues also include a second first base immediately adjacent to the main one. This is usually orange and the batter running through first base is supposed to run straight through it. This minimizes the chances of a collision. By the same token some leagues have an alternate home plate and rule that plays at home are always force plays. In these cases there is typically a white line drawn approximately 1/3 of the way down the baseline that is considered a point of no return. This is designed to reduce the "Pickle" which can put a great strain on the ankles and knees of older baserunners. In the recent years, the NCAA rules changed when concerning the batters feet while in the box. The rule now states that as long as any part of the batter's foot is in the box the ball will stay live. It is not until the batter's entire foot is out of the box, that the play will be declared dead and the batter called out. The SEC (college ball), however, claims that if any part of the batter's foot is out of the box when she makes contact, she is out and the play is dead. In softball, a pitch is the act of throwing a softball toward home plate to start a play. The phases of throwing include the grip, stance, windup, stride, release and follow through. The selection of which pitch to use can depend on a wide variety of factors including the type of hitter who is being faced; whether there are any base runners; how many outs have been made in the inning; and the current score. The responsibility for selecting the type of pitch is traditionally made by the catcher by relaying hand signals to the pitcher with the fingers. In more advanced play, coaches may give signs to batters and/or runners to initiate special plays in certain situations. A catcher may signal to a position player that they will be trying to throw the runner out. A runner on base may see the pitch sign given by the catcher and hint it to the batter using hand or body motions. The pitching distance can range between 35 and 43 feet. The pitches travel at speeds of more than 65mph. - The pitcher begins with her arm at the hip. Then she brings the ball in a circular motion over the head, completes the circle back down at the hip, and snaps the hand. - The ball is not brought over the head at all but down and behind the body and back in one smooth motion tracing out a figure eight. - A "modified" fastpitch is identical to a "windmill" pitch except the arm is not brought over the head in a full windmill motion, but instead is brought behind the body (restricted back swing) and is then thrust directly forward for the release. The pitching distance is 50 feet. The pitch must be lofted in such a way that it falls onto the plate in order for it to be a called strike (the ball falls into the strike-zone instead of flying through). Strikeouts are rare in slowpitch. Pitchers strategize to pitch the ball with a high enough arc that the batter cannot hit a line-drive. The speed of the pitches ranges from 25-35mph, resulting in plenty of reaction time. - The pitch must be thrown with an arc between 6-12 feet high. If the arc is not high enough, the umpire will call the pitch illegal. The fastball is the most common pitch in softball and easiest to learn. - Most difficult pitch to learn and to teach. - Some pitchers successfully develop both an off-speed and a full-speed peel drop. - Ball start off the plate on the inside and curves into the strikezone. The inside curve is frequently thrown at the batters hands so as to jam them forcing a foul hit. The changeup is the staple off-speed pitch, usually thrown to look like a fastball but arriving much slower to the plate. Its reduced speed coupled with its deceptive delivery is meant to confuse the batter's timing. - This is the basic pitch that is used by most pitchers in the slow-pitch game. To throw the floater accurately, pitcher holds the ball with just hers fingertips and does not let them touch the laces. Then comes straight up with her hand and lets the ball go up to the 12-foot mark and come down. Knuckleball in baseball is sometimes called floater. Pitchers throw the ball with an underhand motion. The International Softball Federation holds world championships in several categories. The ISF is the international governing body. The Amateur Softball Association is the National Governing Body of Softball for the United States pursuant to the 1976 Amateur Sports Act. Due to the popularity of the sport, there are a multitude of governing bodies such as the United States Specialty Sports Association, International Softball Congress and the National Softball Association. The ISF holds world championship tournaments in several categories. The tournament in each category is held every four years—two years from 2010. The most recent tournament was XII Women's World Championship in June, 2010. All World Championships use a Page playoff system and are in fastpitch. There are also several World Cups held at 4-year intervals in different categories. New Zealand are the current Men's World Champions, having won the title in 2013. Prior to that, Australia won the World Championship in 2009 and New Zealand had won the previous three tournaments before that. The current Junior Men's World Champion is Argentina, having won the title in 2012. In the Women's World Championships the United States is the most dominant team, having won three of the past four Olympic tournaments and the past seven World Championships. The current Junior Women's World Champion is the United States. New Zealand is the most successful nation at men's world championship softball, having won their seventh title in 2017. The New Zealand women's team have also won a number of World Championship titles in the past. The game is widely played in New Zealand and is the second most popular summer sport behind cricket. Softball is played in all states and territories in Australia and at all levels of academic education. The game is widely promoted to maintain fitness, health, personal achievements and pleasure. Australia has excellent softball teams which are a reflection of its coaching, education and training system. Japan has had a long tradition of softball which is played at all levels in the country. Many high schools and colleges have sports programs which include softball. Like baseball, softball in Japan is intensely competitive. Japan's win over the United States at the 2008 Olympics reflects the advanced level of play in this East Asian country. China is fast becoming the team to watch in softball. Since the silver medal in the Atlanta Olympics 14 years ago, the Chinese have now made softball a priority at all levels. The game is played in most schools and with a 1.3 billion population; the number of great players is turning out to be a boon for China. The Chinese have frequently toured the US and have now similar caliber coaching and training programs. Softball is played in almost every country in Europe, mainly fastpitch. Every two years an open women's European fastpitch championship is held with over twenty nationals teams. Italy and Netherlands are the best nations, and both have an almost professional championship where athletes from the US, Australia and China play. In the men's division eight to ten national teams compete for the European championship, with the Czech Republic, the Netherlands and Denmark leading the way. It is estimated that 14.62 million Americans played at least one game of softball during the spring of 2015. It is played by men and women both recreationally and competitively. Softball is played, at some level, in over a hundred countries around the world. The International Softball Federation has 113 member countries (excluding dependent territories). There are many different sanctioning bodies of softball: USSSA, ASA, ISA, NSA, WSL, USFA, Triple Crown and SASL just to name a few. One of the biggest is the Amateur Softball Association, also known as ASA. It is known as the national governing body of softball, was established in 1933 and has over 240,000 teams. The USSSA, founded in 1968 as the United States Slo-Pitch Softball Association, but renamed in 1997 to the United States Specialty Sports Association, is the only association that still has a men's major slow-pitch program alive. Currently, the USSSA program is run out of Viera, FL. The United States also has a competitive women's softball team that competes in international tournaments. They represented the USA each time at the Olympics until softball was removed from the Olympics. The USA Softball Men's Fast Pitch National Team has won five World Championships (1966, 1968, 1976, 1980 and 1988) and three other medals. In the Pan-American Games, Team USA has made the finals in all seven appearances at the Games when Men's Fast Pitch was played. ^ a b "2010–2011 Women's Softball Rules (2 Year Publication)" (PDF). Ncaapublications.com. Retrieved 2017-01-28. ^ "softball." The Columbia Encyclopedia. New York: Columbia University Press, 2008. Credo Reference. Web. 21 September 2012. ^ a b c d "The History of Softball". International Softball Federation. Archived from the original on December 12, 2006. Retrieved 2006-12-31. ^ "History of Softball". SoftballPerformance.com. Retrieved January 11, 2009. ^ a b c d David Levinson & Karen Christensen, ed. (1996). Encyclopedia of World Sports. London & New York: Oxford University Press. pp. 371–73. ISBN 0-19-512778-1. ^ Mack, Robert C. (1979-07-16). "National Register of Historic Places Inventory—Nomination Form: Fire Station No. 19". National Park Service. Retrieved 2014-11-29. ^ a b Inventions and Discoveries 1993. Facts on File. p. 127. ISBN 0-8160-2865-6. ^ "Chicago 16 Inch Softball Hall of Fame". Retrieved 2010-06-12. ^ Newman, Craig. "Mike Royko holds court at the Billy Goat on softball". Archived from the original on 2010-05-02. Retrieved 2010-06-12. ^ "The 117th IOC Session in Singapore – A Summary". Singapore National Olympic Council. Archived from the original on 2008-07-25. Retrieved 2008-08-24. ^ Austen, Jacob (2005). "Softball, 16-Inch". Archived from the original on 2007-08-08. Retrieved 2007-10-12. ^ a b c d e f g h i j International Softball Federation Playing Rules Committee. "Official Rules of Softball" (PDF). International Softball Federation. Archived from the original (Adobe Acrobat (pdf)) on February 18, 2007. Retrieved 2007-02-19. ^ Herman, Al. "What is the Distance From Home to the Pitching Mound in Softball?". Retrieved 2012-06-01. ^ Rules of Baseball. Objectives of the Game: Major League Baseball Enterprises. 1998. ^ Wynne, Sharon Kennedy (2005-07-27). "A kinder, gentler softball". St. Petersburg Times. Retrieved 2007-02-19. ^ "Addressing Eye and Facial Injuries". Market Wire. February 2008. Archived from the original on 2008-05-29. ^ "Addressing Eye & Facial Injuries in Youth Baseball / Softball With an Advanced Faceguard | Market Wire | Find Articles at BNET.com". 2008-05-29. Retrieved 2018-09-24. ^ "Basic Softball Rules". Kids Sports Activities. Retrieved 2018-09-19. ^ "Softball – About". International Olympic Committee. Retrieved 2008-08-17. ^ Peterson, Brian. "Baserunning To Victory." Coach & Athletic Director 71.10 (2002): 46. Academic Search Elite. Web. 21 Sept. 2012. ^ "Designated Player (DP) / Flexible Player (Flex) Rule Explained" (PDF). Kelowna Minor Fastball. Retrieved June 13, 2017. ^ Buzzle sports web. "Softball rules and positions" 2010-02-10. ^ "Men's, Women's, and Co-Rec Slow Pitch Softball Rules" (PDF). Crec.unl.edu. Retrieved 2017-01-28. ^ "Tulane University Intramural Sports – Softball Rules". Tulane.edu. Archived from the original on July 20, 2011. Retrieved 2012-10-29. ^ "13.24" (PDF). Recsports.gmu.edu. Archived from the original (PDF) on 2012-04-01. Retrieved 2012-10-29. ^ "Coed Softball Rules: Institutionalized Sexism". Womentalksports.com. Archived from the original on April 7, 2012. Retrieved 2012-10-29. ^ "Technical & Venue Manual for Olympic, World Championships, Regional, and Multi-sport Competitions" (PDF). International Softball Federation. 1952–2003. p. 4. Archived from the original (PDF) on October 25, 2006. Retrieved 2007-03-18. ^ "Past Results". International Softball Federation. Archived from the original on February 22, 2007. Retrieved 2007-03-18. ^ "Events Calendar". International Softball Federation. Archived from the original on March 2, 2007. Retrieved 2007-03-18. ^ Blackshaw, Andrea (2004-02-09). "New Zealand Three-peats at Men's World Championships". International Softball Federation. Archived from the original on October 25, 2006. Retrieved 2007-03-18. ^ "Australia Claims Jr. Men's World Championships". International Softball Federation. 2008-07-01. Archived from the original on March 12, 2009. Retrieved 2009-10-01. ^ "USA Wins 2006 Women's World Championship". International Softball Federation. 2006-09-05. Archived from the original on March 4, 2007. Retrieved 2007-03-18. ^ "Four Teams Qualify for 2004 Olympic Games". International Softball Federation. 2002-08-04. Archived from the original on October 25, 2006. Retrieved 2007-03-18. ^ "Japan Dethroned as World Champs". International Softball Federation. 2007-06-30. Archived from the original on July 7, 2007. Retrieved 2007-07-05. ^ "Olympic Preview: Softball —". Infoplease.com. 2000-07-01. Retrieved 2012-10-29. ^ Wilson, Stephen (23 July 2012). "Baseball and Softball agree to merge in a bid to win reinstatement to Olympics": 1. ^ "Softball Australia | Softball Australia". Softball.org.au. Retrieved 2017-01-28. ^ "エステ･脱毛体験はしご術". Chinesesoftballfederation.com. Retrieved 2017-01-28. ^ "• Number of softball players & baseball players in the U.S. 2016 | Statistic". Statista.com. Retrieved 2017-01-28. ^ "About Softball". Australian Softball Federation. Archived from the original on August 29, 2007. Retrieved 2006-12-31. ^ "Directory/Member Countries". International Softball Federation. Archived from the original on October 25, 2006. Retrieved 2006-12-31. ^ "USA Softball" (PDF). Teamusa.org. Retrieved 2017-01-28. ^ "• International Medal History; USA Softball". teamusa.org. Retrieved 2017-10-09. Wikimedia Commons has media related to Softball. This page was last edited on 22 April 2019, at 21:01 (UTC).